So my friend A picked one of the most delightful weeks in London to come visit. It was sunny, it was September so most of the crazy tourists were all gone, and I managed to join him for some adventures around town. I've always meant to check out the Towpath Cafe, seeing as how it's less than 10 minutes walk from where I live and I regularly jog past it when I'm motivated enough to go for a run. Finally, A's visit gave me an excuse, and there was no way we could pass up basking in the sun alongside the canal. 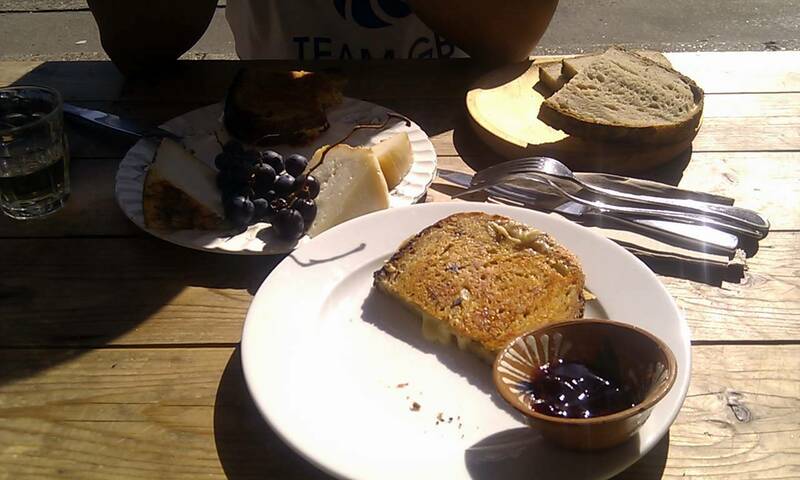 Since we mostly wanted a bit of a snack, we chose what we thought would be two relatively light plates of food, a grilled cheese sandwich and a cheese plate. What we got were total gut bombs (in a very very good way, of course). The grilled cheese was buttery, crisp, and packed full of sharp flavored cheese with a tangle of green onions mixed in. Like the grilled cheese you can get at Borough Market (but dare I say, perhaps even better?) The cheese plate was absolutely enormous for the £6.50 we paid. 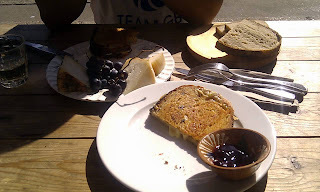 Three doorstopper sized wedges of cheese graced the plate, alongside grapes and a board full of fresh brown bread. As much as we tried, we couldn't quite get through all the cheese, and then we waddled off into the sunshine to walk it all off.